Perfect for Birthdays, Graduations or any other celebration, these confetti fortune cookies are definitely a refreshing break from the ordinary! 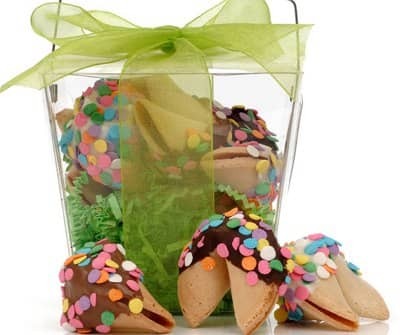 Our Take Out Pail of 6 Confetti Fortune Cookies are festive and delicious! Baked fresh in small batches each day, each crisp vanilla fortune cookie is hand dipped in your choice of Belgian Chocolates or Golden Caramel and decorated with a generous shower of confetti candy sprinkles. Each cookie is meticulously wrapped in its own crystal clear cellophane bag and heat-sealed at both ends for freshness and quality. They are delicately placed on a bed of crinkle shred in a clear acetate take out pail and tied with coordinating ribbon. Perfect for Birthday, Graduation or other celebrations, these Confetti Fortune Cookies are definitely a refreshing break from the ordinary!